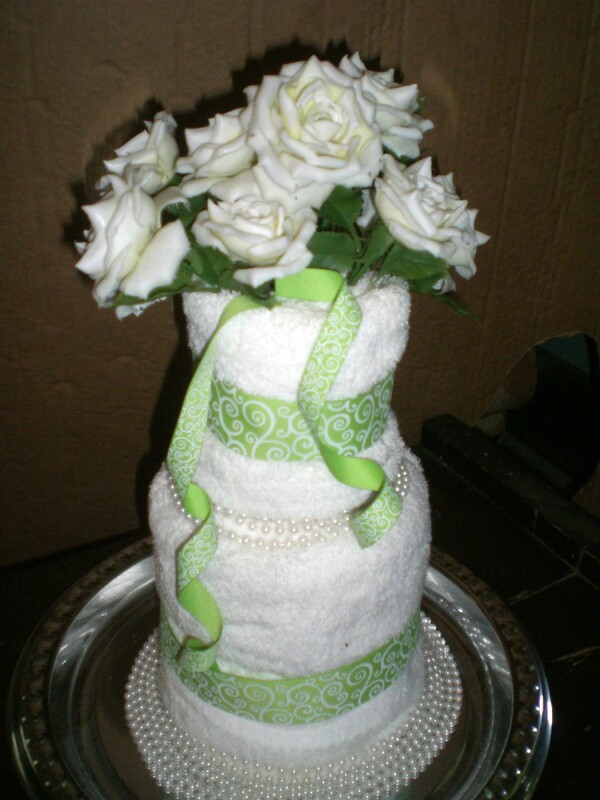 This lovely centerpiece or gift is made with towels, a bottle of wine, ribbon, and fresh or faux flowers. 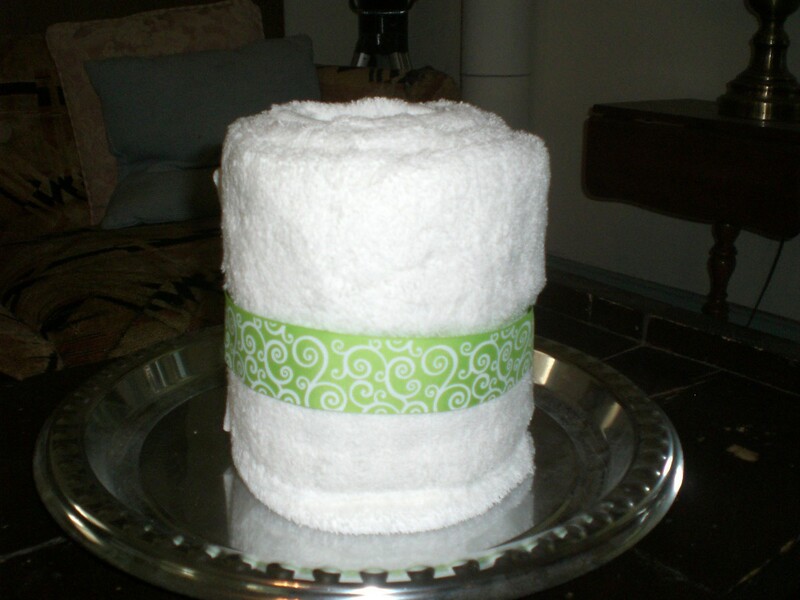 Learn how to make a bridal shower towel cake centerpiece. 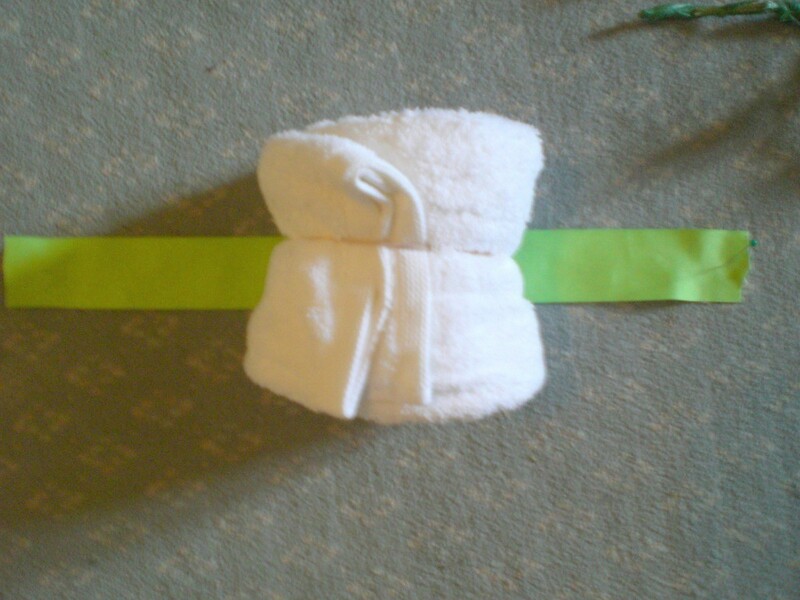 I saw the cutest idea at a craft show and decided to duplicate it here for an upcoming shower. 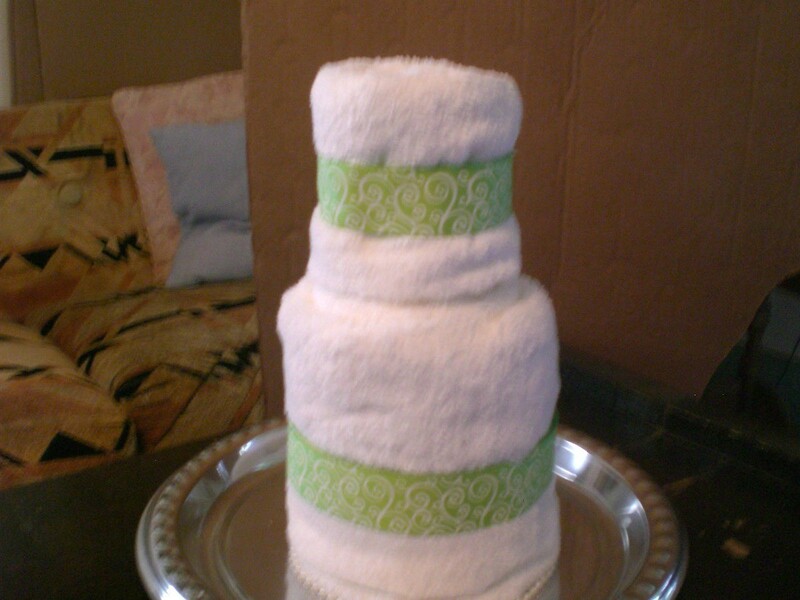 Make a wedding cake from towels, wine, ribbon, and flowers. 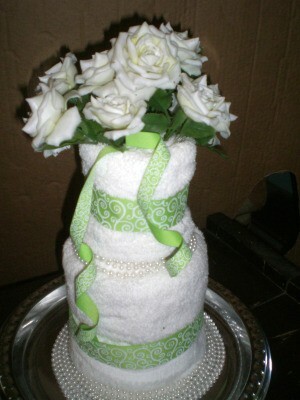 You can color coordinate it to the wedding colors in you'd like too! a long string of beads (these were a flea market find of Christmas beads!" 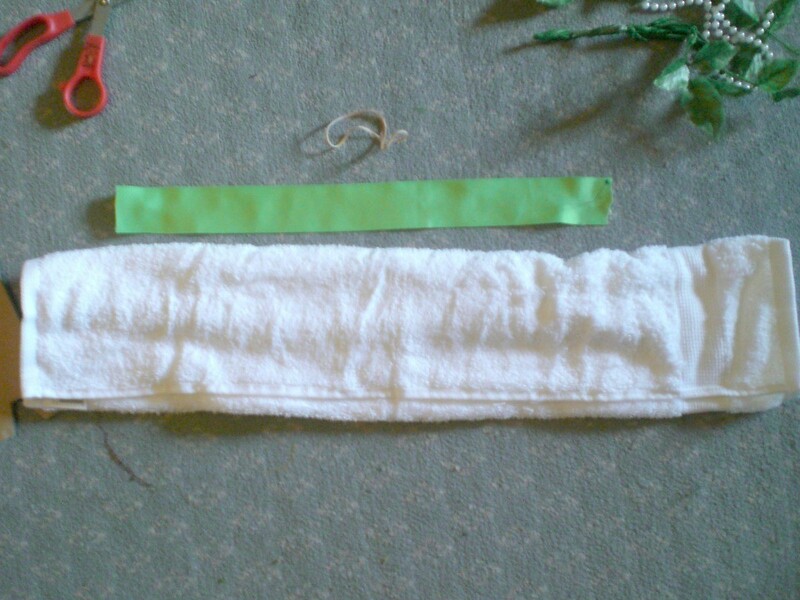 Fold the hand towel into thirds, roll, and secure with a rubber band in the middle. 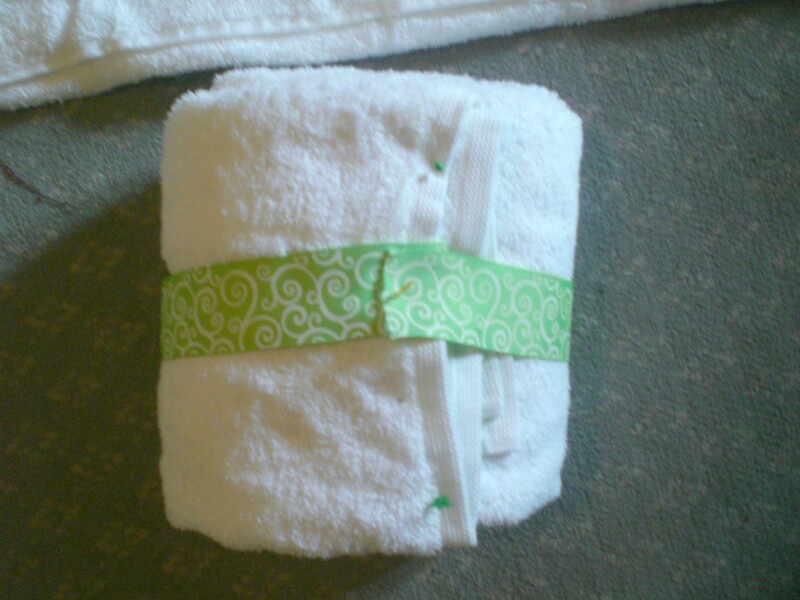 Fold the large towel into fourths, roll, and secure with a rubber band in the middle. 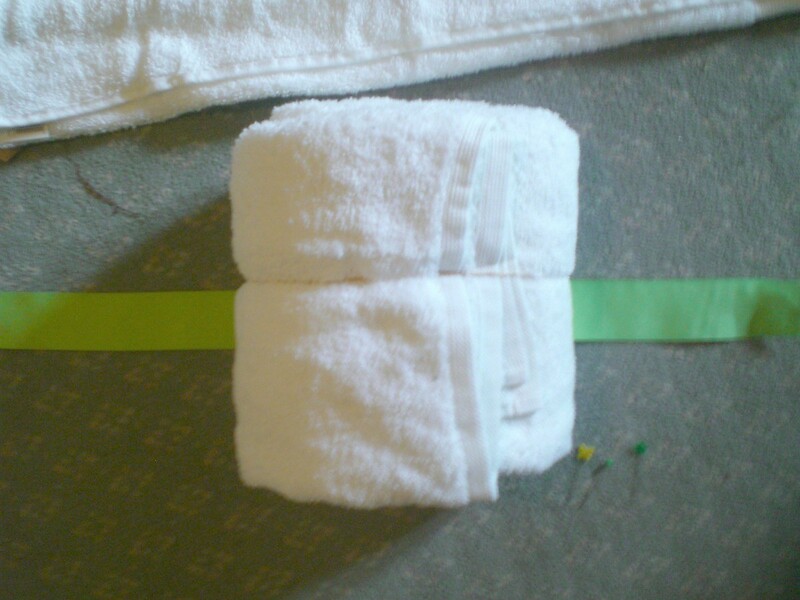 Wrap each towel with a pretty ribbon and pin it onto the towel with a pushpin (or stitch if you are so inclined). 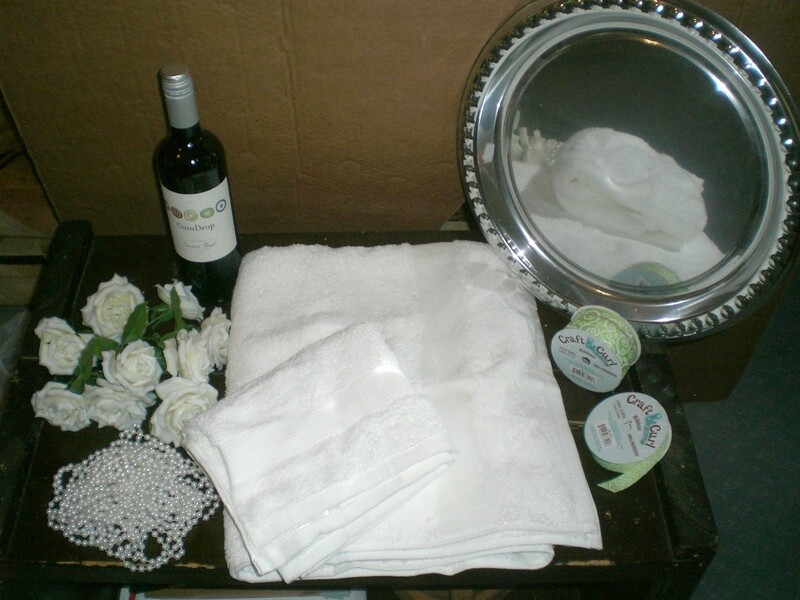 Place the large towel onto your tray and circle it with your beads. 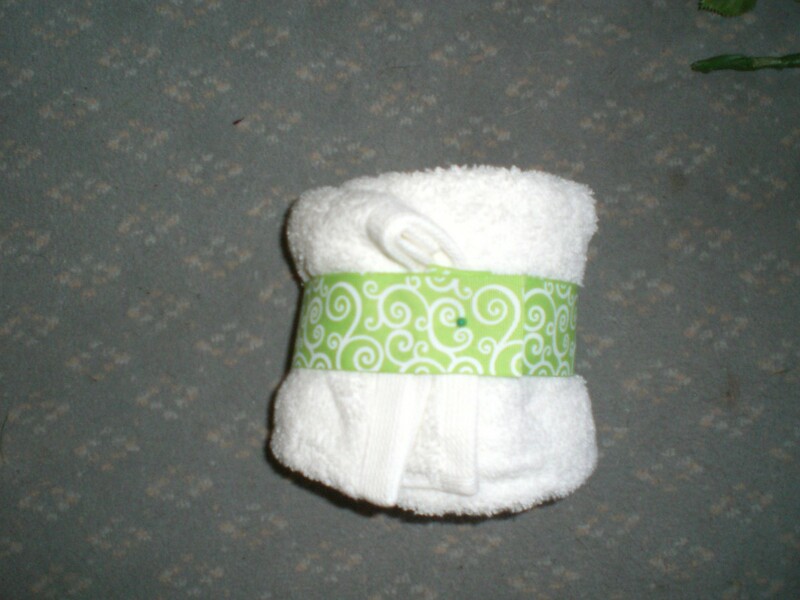 Experiment and wrap it as much or as little as you'd like! 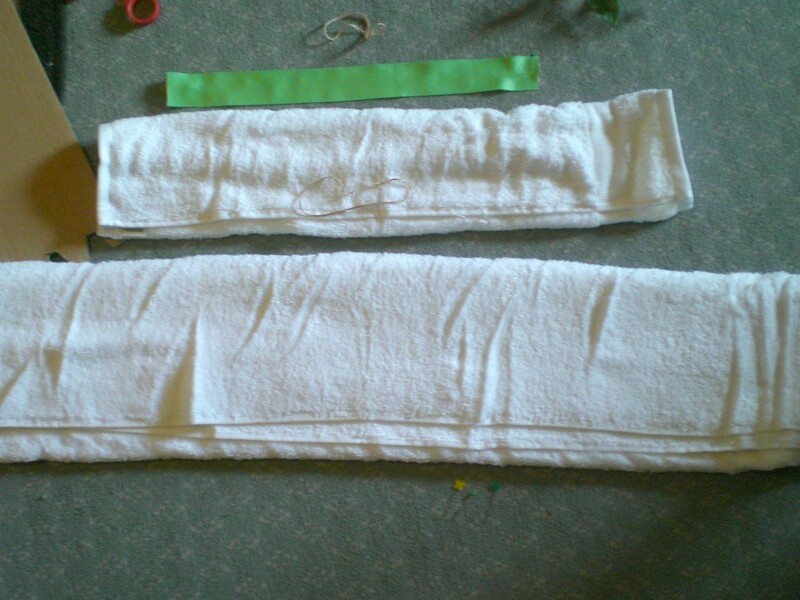 Tuck the ends under. 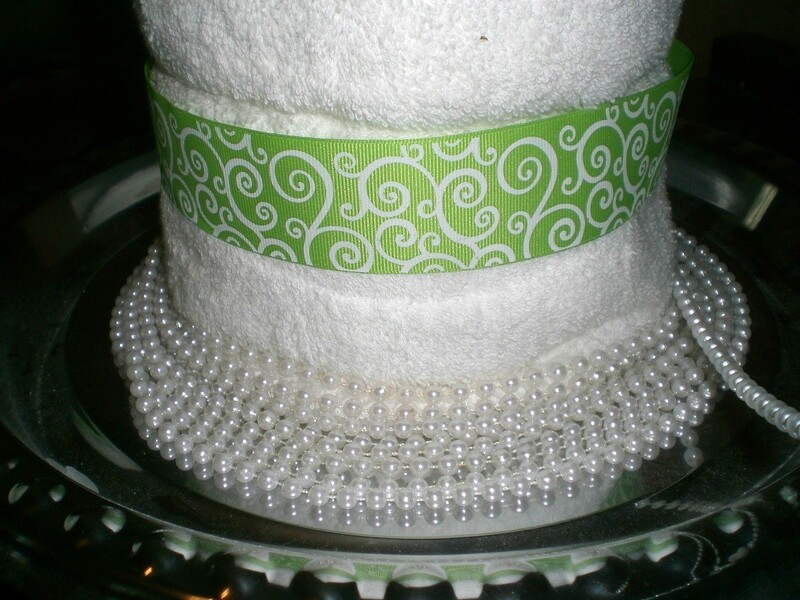 Place your bottle down the center of the both towels and repeat wrapping the beads around the second tier. 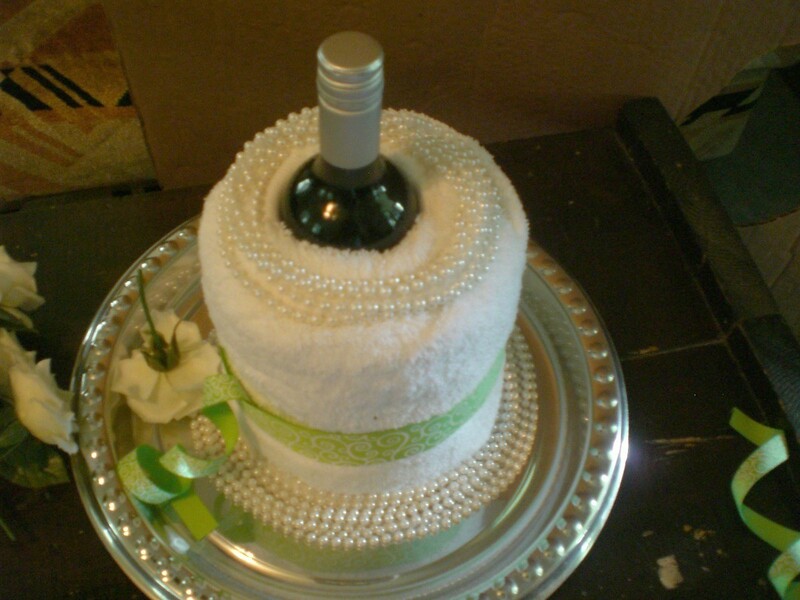 I removed the top towel to show you the bottle..for a neat presentation, wrap the beads after placing the top towel on the 'cake'. Finish by arranging your flowers and ribbon spirals at the very top. Wow, its very nice idea!